Hello, crafters! Are you ready for another sketch challenge? Before you get started, don't forget about this month's Beat the Heat challenge! I guess I'm on a little bit of a circle kick because I have circles again for you this week! I promise no more circles for at least a month, okay? 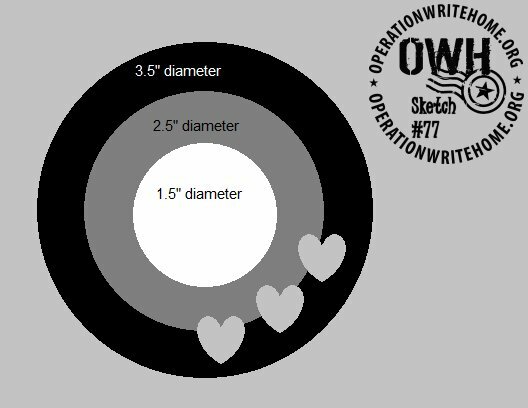 Also, keep in mind that on OWH sketches, the heart shape always indicates the embellishment of your choice, it doesn't have to be a heart. Our samplemaker this week is the awesome cardmaking duo of Joanne and Nancy. They have a blog called Stamp Tramps! Be sure and visit to see more of their work and leave them some good comments. Thanks again for the great samples, ladies! Okay, cardmakers! Get going and don't forget to come back here to link up your blog entry or Flickr photo! I love visiting y'all each week. I hope you all visit each other and leave some encouraging comments. Great sketch, Julie! I really like the circles... I know I used ovals for my card today, so don't be fooled. :) LOL! Sandy, just a quick note for my blog that's listed on the side. I've changed the name of my blog from "Paper Pleasures and Stamping Delights" to "Live, Love, Laugh...and Craft!"